translation: She was born in a traditional Jongo* territory in the outskirts of Valença. At the age of 8, she came with her family to the nighborhood of Oswaldo Cruz in Rio de Janeiro and studied in a Catholic boarding school. From her mother, she learned prayers in Jeje, Nago, and songs in dialect. These influences resulted in a sincretic mysticism and a musicality marked by samba and traditional slave songs from the countryside. She played an important role in the emergence of the Portela samba school. 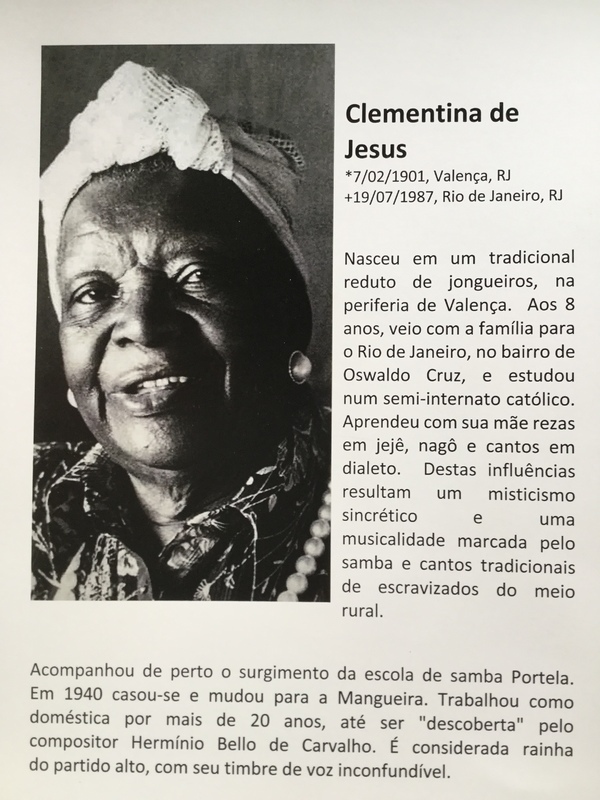 In 1940, she married and moved to Mangueira. She worked as a domestic for more than 20 years, until she was “discovered” by composer Herminio Bello de Carvalho. She is considered the queen of the alto voice for her unmistakable timbre. *Jongo is a drum rhythm, a song and a dance originating from Congo-Angola, which was continued by the enslaved in rural Brazil. Today, descendants keep this tradition in both rural and urban strongholds.